Preheat oven to 375 degrees. Lightly grease a medium baking dish. Place Parmesan cheese, eggs and bread crumbs in three separate small bowls. Heat the oil in a large skillet over medium-high heat. Dip each piece of chicken into the bread crumbs. Brown the chicken on both sides, then transfer to the prepared baking dish. Pour wine into skillet, and scrape up the browned bits. Add mushrooms and cook for 5 minutes, or until tender. 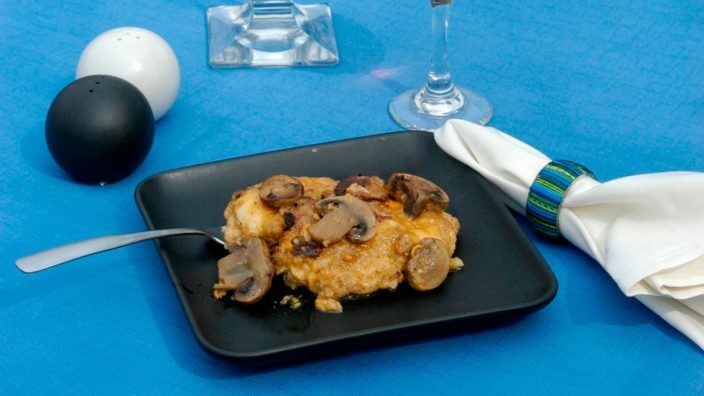 Top each chicken breast with Monterey Jack cheese, then spoon mushrooms over cheese. Pour the remaining wine from the skillet over all. Cover dish with aluminum foil. Bake 30 to 35 minutes in the preheated oven, or until chicken is no longer pink and juices run clear.